Should Waffle Weave Towels be Washed Before Embroidering? If you like the Teacup and Fleur-de-Lis designs that Deborah used on the waffle weave towels, you can get them at our Free Designs Page. And remember the White Waffle Spa Weave Towel and Colored Honeycomb Waffle Kitchen Towels, both featuring that distinctive waffle texture. The following are a few techniques to make hooping our Small and Large Cosmetic bags easier. First, hoop a piece of mid-weight tear-away style stabilizer. Next, spray the hooped stabilizer with a temporary fabric adhesive like the 505 Spray we offer at www.embroiderthis.com. Then adhere the area of the item to be embroidered directly to the sticky surface of the hooped stabilizer and you are ready to stitch! If your embroidery machine offers a basting function, you may want to baste around the design area before you start stitching out the design for added security. If the item is extremely bulky, you may find it easier to hand baste the item to the stabilizer. 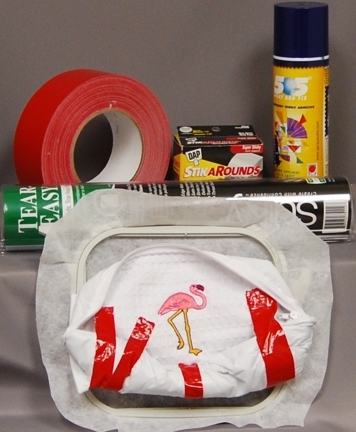 For most items, the fabric adhesive spray is enough to hold the item securely without the added basting step. To expose and flatten the design area for stitching, first turn the item inside out! This makes it quite easy to flatten and isolate the area to be stitched. Roll any excess material out of the way and secure. You can use double sided tape, pins, and binder clips (available at office supply stores) to secure the extra material out of the way. Cosmetic bag hooped and ready. Note the duct tape holding extra material out of the way. You can also use either duct tape or Super StickyDap® StikArounds™ adhesive dots. Both products have great temporary adhesive power and will hold the extra fabric out of the way while you stitch. The duct tape and StikArounds™ are easy to remove cleanly after stitching is complete. Deciding which needle type to choose for a project can be daunting. We carry a great selection of sewing machine needles specifically designed to give you professional results on your embroidery machine whether you are stitching on a basic home style sewing machine with an embroidery attachment or using a multi-head commercial embroidery machine. Below you will find some handy Needle Notes to take the mystery out of choosing the best needle for the job! We carry two Classes of Needles for Machine Embroidery at www.embroiderthis.com. Home Machine Needles – the shaft of these needles that fits up into the sewing machine has a half round on one side and are flat on the other. Commercial Machines – the shaft of these needles that fits up into the sewing machine is fully rounded. Check the needle that you have been using in your machine to see if it has a flat side. If so, you will use the home machine needles. If it is fully round, you should order the commercial machine needles. SHARP OR BALL POINT TIP? Needles can have either a Sharp Tip or a Ball Point Tip. Sharps are used for woven fabrics (all of our cotton and linen fabrics offered at Embroider This! ). Ball Point Tips are designed to be used on Knit fabrics only (like our cotton interlock fabric). Sharp needles pierce the fabric when they stitch. Ball Points push the fibers out of the way when they stitch so the needle slips in between the individual fibers. This prevents knit fabrics from getting a run (like in your stocking!). Our Ball Point needles have BP as part of the item#. We offer two sizes of needles 75/11 and 90/14. The first # is the European number and the second# is the USA size designation. The tip of the needle that goes into the fabric is thinner (smaller) on the size 75/11 than the stip of the 90/14. Use the 75/11 for most of our products. The 90/14 has a thicker tip and will make a bigger hole when it pierces the fabric. It is best for heavier fabrics like our blankets or throws. HOW MANY IN THE PACKAGE? Organ Titanium are the overwhelming needle of choice by Embroidery Professionals. Organ Needle Company’s Titanium Needles stay sharp longer, result in less thread breakage. The needles last much longer than other brands so you can save you money as well as aggravation! 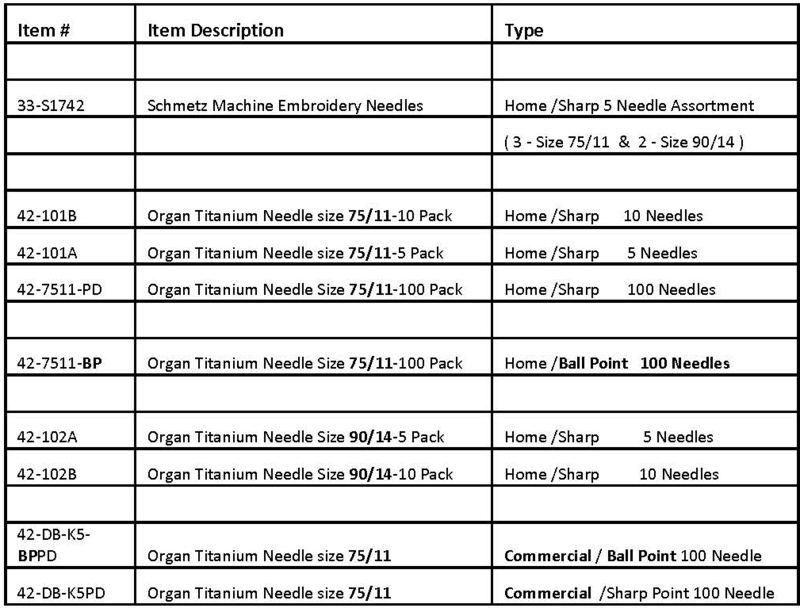 Here is a handy chart outlining the Sewing Machine Needles for Machine Embroidery we carry at www.embroiderthis.com. Have you ever struggled with hooping an item for your machine embroidery project? Have you ever wondered if there was a better or easier way to hoop? Well wonder no more. Following is a hooping tutorial I have compiled that outlines three of my favorite hooping methods. Follow the hooping guidelines below and you will turn out professional looking embroidery with ease. Please leave a comment at the end of this article , I love your feedback! Proper hooping is one of the most challenging and important machine embroidery skills. Hooping the item correctly is critical to obtaining a professional result. Improper hooping can cause a myriad of issues such as misalignment of the design on the garment, puckering of the fabric , thread looping or breaking, or design registration issues (when the stitches don’t line up or “register” properly in the design, especially on outlines). Hooping for machine embroidery is a challenge because the process requires you to handle multiple loose layers of fabric and stabilizer simultaneously and it requires you to keep those layers straight and wrinkle free while they are aligned precisely and placed under tension in the embroidery hoop so your design ends up stitching out well and where you intend on the fabric. Hooping an item for machine embroidery can at first make you feel like you have ten thumbs, but with the help of the hints below and just a little practice you will soon be hooping like a pro! the size and type of the hoop required for the project. The following techniques will help you learn to hoop your projects accurately and with ease. Remember that this process will be a bit cumbersome at first but practice will improve your skills and help you become proficient in a short period of time. Machine embroidery requires that the fabric be well stabilized. Stabilizer keeps the fabric from shifting, stretching, or puckering while under the stress of high speed machine embroidery. At least one layer of stabilizer should be placed underneath the fabric in the hoop for every machine embroidery project. Wash-away stabilizers can be rinsed away in plain water. Heat sensitive stabilizers crumble under the heat of an iron and then can be brushed away. Because there are so many types of stabilizers, I will address in greater depth the various types of stabilizers and their uses in a separate tutorial document. In the meantime, here are a few notes on the most common stabilizers to use with products from EmbroiderThis.com. A mid-weight tear-away type is the stabilizer of choice for most of the linen and cotton items offered by Embroiderthis.com. One or two layers on the back side of the item to be embroidered is sufficient. We offer Sulky® Tear-Away Stabilizer in various sized rolls and in pre-cut sheets. Thick or textured fabrics like waffle weave or terry cloth may benefit from an additional layer (s) of wash-away type stabilizer placed on top of the fabric during the machine embroidery process. These wash-away top stabilizers can be rinsed away with water after the machine embroidery is complete and act only as a temporary support. Any thick or loose piled fabric, like terry cloth or waffle weave, should be topped with a layer of wash-away type stabilizer to keep the stitches from burrowing too deeply down into the pile of the fabric and to keep the needle from accidentally catching on a loop of the pile during embroidery. Knit and interlock fabrics are very stretchy in all directions and can easily become misshapen under the stress of hooping and high speed embroidery. A cut-away type stabilizer that offers no stretch will keep the item stable in the hoop. We offer Sulky® Cut-Away stabilizers in rolls. Knits benefit from stabilization on the top of the fabric as well as underneath to keep the fabric from shifting, puckering, or stretching while being embroidered. There are many different types and sizes of machine embroidery hoops available. Each brand of embroidery machine has hoops especially designed to fit that particular brand of machine. Most embroidery machines come with a standard 4” x 4” size hoop and many machine manufacturers also have specialty and large sized hoops available for purchase as an accessory. There are also specialty hoops like those designed for caps or hoops that hold your fabric in place with magnets. Check with your embroidery machine’s manufacturer or specialty hoop manufacturer to see if their product is designed to fit your brand and model of embroidery machine. All hoops function basically the same. The item to be embroidered and the stabilizer(s) are sandwiched between an inner and an outer hoop ring and held in place by the pressure of the two hoop pieces. The hoop is then attached to your embroidery machine for stitching. It is important that the area of the item to be embroidered is oriented correctly in the hoop so the design will be stitched out in the proper location and in the correct alignment on the fabric. To aide in proper positioning of the design, you can use your embroidery software to print out a paper template of the design. A paper template is the same size and shape of the finished embroidery and allows you to audition placement options before actually stitching. I like to cut out this paper copy of the design and pin the paper template directly on the item, then stand back a bit to get the overall visual effect of the design placement. If you are embroidering on a garment, pin the paper design template on the garment then try the garment on. It is often difficult to evaluate the placement of a design on a garment unless the garment is on a body. Finding the most pleasing placement of the design is often easier when done by using a paper template. Once you have determined where you wish to place the design on the fabric, you should mark the center point of the design as well as vertical and horizontal positioning lines to help you align the design area of the fabric in the hoop properly. Sometimes just a finger pressed crease line is enough to mark the fabric. Other times, you will want to mark the fabric using a pencil, a marker especially designed to mark fabrics, chalk, or even bits of tape. Test any marking tool on a scrap of fabric before using it on your final fabric to be certain the marks can be easily removed and that the marking method will not damage the fabric. I generally use an air erasable or water erasable marker (available in local sewing shops) to mark placement lines for my designs. To find the center of the design and to create guidelines for horizontal and vertical alignment, fold the paper template in half top to bottom then in half again side to side creasing each fold with your finger. When you unfold the paper, the crease lines now form guidelines to mark the center of your design (where the two lines meet in the middle) as well as the central vertical and central horizontal lines of your design to mark on your fabric. Pin the creased template to the fabric exactly where you wish to embroider the design, then transfer the center mark and the central guidelines to the fabric using one of the marking methods described above. Once the placement lines are marked, you can remove the paper template from the garment and use the marked lines only to orient the fabric in the hoop, or if you prefer, you can leave the paper template pinned to the fabric until your item is hooped and you are ready to sew. Now that you have marked the placement of your design on the item to be embroidered, it’s time to get it in the hoop! I recommended that you always use the smallest hoop that the size of the design allows. The smallest size hoop will offer the best support of the fabric around the design area giving you the most professional looking results. Smaller hoops are also easier to use and require smaller pieces of stabilizer. Rotating the orientation of the design (turning the design) in the hoop may allow you to use a smaller sized hoop. When hooping, it is important to work on a hard flat surface. This will give you the best leverage so you can position the item in the hoop properly. Make sure the stabilizer is cut about an inch larger all around than the hoop being used. The stabilizer should extend beyond the hoop edges at about an inch in all directions. So, for example, a 5” x 7” hoop should use a piece of stabilizer cut to about 7” x 9”. There are many different methods to place the fabric and stabilizer in the hoop. Below, I will describe three of my favorites. Like any new skill you will find that practice will improve your technique so try practicing each method before you decide which one you prefer. You may find it beneficial to try hooping the same item using these three different methods to see which one is most comfortable and gives you the best results. Most hoops are made up of two pieces: the outer hoop and the inner hoop. The outer hoop frame usually has the embroidery machine attachment point and a thumbscrew mechanism to adjust the hoop pressure. The thumbscrew mechanism allows you to adjust the size of the outer hoop so you can accommodate a variety of fabric thicknesses. The inner hoop (top hoop) fits inside the outer hoop and works to supply pressure on the fabric to keep it taut during embroidery. The tension between the two hoops is adjusted using the thumbscrew mechanism. The goal is to get all the layers settled snugly in between these two frames, while keeping the layers aligned properly and wrinkle free. The fabric should be snug in the hoop, but not stretched out of shape or under pressure. The proper tension is a “neutral” tension where the fabric is not stretched but is not allowed to move out of shape. The hoop tension should be set before you hoop the actual item to be embroidered. So, before beginning to hoop the actual project, perform a hooping practice run with fabric and stabilizer of the same type you plan to embroider to set the proper tension of the two hoop pieces. Place a piece of the fabric and stabilizer in the hoop and adjust the tension of the two hoop pieces. The hoop tension should be firm enough to hold the fabric taut and wrinkle free, but not place undue stress on the fabric or stretch it out of shape. Remember, you are aiming for “neutral tension”, not stretched and not sagging! Too much pressure on the fabric can cause permanent marks on the fabric or cause stretching of the fabric and puckering of the design. Too little tension will cause your design to sag or pucker and can cause the design stitches to be misaligned. The inner hoop should seat into the outer hoop with a bit of pressure. It should not drop into place easily nor should you have to jump on the hoop to get it seated. Determining the correct tension using this practice piece of fabric and stabilizer allows you to set the tension of the hoop to its proper place without concern of design alignment. You can then be assured that the tension will be correct when you hoop the actual item you plan to embroider and will not need further tension adjustments. Adjusting the tension screw while an item is in the hoop can cause uneven tension distribution on the fabric. The tension around the screw actually ends up being looser and other areas can be pulled a bit out of shape. Presetting the tension takes one variable out of the hooping process and ensures that when you hoop the item it will have the proper tension and there will be an even distribution of this tension on the fabric in the hoop. This method uses the center marking arrows on your hoop to help you line up the fabric while placing it in the hoop. First, place the outer hoop (the one with the tension adjustor and the arm that attaches to your embroidery machine) on a flat surface and orient the hoop so the top of the hoop faces away from you and the bottom of the hoop faces you. Locate the center markings on this hoop. There should be small arrows indicating the center of the hoop on all four sides. If your hoop does not have these marks, measure and determine the center point of the hoop sides and mark it with a small piece of tape or a permanent marker. Mark the center of the 4 sides of your inner hoop as well. Mark the placement lines for the design as described above. Layer the fabric to be embroidered on top of the stabilizer. Fold the fabric and stabilizer in half from top to bottom directly through the center of the design area and crease the fabric with your fingers to mark the horizontal center for your design. Fold again, this time side to side, directly through the design area and finger press to mark the vertical center of the design area to be embroidered. Keeping the fabric/stabilizer folded, lay it on the outer hoop, lining up both of the folded edges with the center marks on the hoop. Using one hand to keep the folds lined up with the center marks on the hoop gently unfold the item keeping the creased lines on the fabric line up with the vertical and horizontal marks on the outer hoop. Next, lay the inner hoop on top of the fabric and outer hoop. Again use the center marks on the inner hoop to check the alignment of the fabric in the hoop. Adjust the fabric so it is lined up with the center marks and smooth out any wrinkles or folds. Next, check that the fabric is oriented in the hoop properly. Look at the design in relation to how the hoop will fit on your machine and be sure the top of your design is facing the correct way. I have been known to stitch designs upside down or sideways if I don’t check this step carefully! Once you are sure of the placement, gently press the inner hoop into place. It is helpful to first push one side of the hoop down while holding the other side lightly in place, then reverse and steady the side you have already done while applying pressure to the other side of the hoop to pop it fully in place. After the inner hoop is seated, check to be sure the crease lines in the fabric are still lining up with the center marks on the hoop and the fabric is oriented correctly. There should be no puckers or sags and the inner hoop should be even and flush all the way around in relation to the outer hoop. If you detect any issues, un-hoop and try again. It is much less of a problem to re-hoop at this point then to try to recover from a bad hooping later on! Mark the design center and the horizontal and vertical placement lines on the item to be embroidered as described above. Next, place all the layers in the proper order for stitching: stabilizer (face up) topped with fabric followed by a top (wash-away) stabilizer if needed. Smooth out any folds or wrinkles. Place the inner (the hoop piece that fits inside the outer frame) on top of the fabric/stabilizer layers. Line up the centering marks of the hoop with the centering marks of your fabric as accurately as possible. The next step involves picking up all the layers including the top frame keeping center marks lined up. After a nice deep calming breath, lift the complete unit, frame/fabric/stabilizer, up with both hands scrunching the excess fabric up on either side as you hold the frame down on the fabric with your thumbs. Line the top frame with the inside edges of the “holding” or outer bottom frame. Unfold the gathered fabric from the sides. Fan out your fingers on your left hand and gently hold the top frame in place using mild pressure. With your right hand pull the stabilizer/fabric taut in all directions. While still applying downward pressure to the frame, switch hands and again straighten layers pulling them taut and smooth in all directions. Push the top hoop down securely into the bottom hoop. Keep fabric and stabilizer as smooth and taut as possible. Check the placement and seating of the item in the hoop as above. This method is particularly helpful when stitching on an odd shaped, irregular shaped, or small items that do not easily fit into a standard hoop. In this method, rather than hooping the actual item to be embroidered, only the stabilizer is secured in the hoop, then the item to be embroidered is pressed directly on to the adhesive surface of the hooped stabilizer to hold it in place during the stitching process. For this method you can use a commercial adhesive tear-away type stabilizer like Sulky® Sticky or a traditional tear-away stabilizer that has been sprayed with a temporary fabric adhesive like the 505 Spray and Fix that we offer on EmbroiderThis.com to make the surface of the stabilizer “sticky”. Sticky Stabilizer from Sulky® is a tear away type stabilizer that has a light adhesive on one side. The adhesive is covered with paper to protect it until you are ready to use. Embroiderthis.com offers this product in various sized rolls as well as in pre-cut sheets. Cut a piece of Sticky Stabilizer approximately 2” larger than your hoop. With the paper side facing up, hoop the stabilizer. Using an old needle, score the paper in an area larger than your design. Then peel the protective paper away from the surface exposing the “sticky stuff”. If you are using a traditional “non-sticky” tear-away stabilizer, you can make it sticky by lightly spray the surface of the stabilizer with a temporary fabric adhesive like 505 Spray offered at www.embroiderthis.com. Mark the center of the design area and vertical and horizontal center lines on the item to be embroidered as described above. Use the horizontal and vertical hoop marks to center the item in the hoop for embroidery. If the item is not flat, try turning it inside out to better expose the area to be embroidered. Fold the item along the vertical and horizontal placement lines as described in “The Line-Up” method above and align these placement lines with the center marks on the hoop. Stick the item (wrong side facing down ) to the exposed adhesive paper. Press the item firmly to the sticky surface of the stabilizer to hold it in place. Smooth any extra material out of the way. I use pins or tape to help hold extra fabric out of the design area if needed. If your embroidery machine has a basting function, use this basting stitch to further secure the item to the stabilizer. If not, simply begin embroidering and the item is held in place by the sticky surface. Mastering the skill of proper hooping will make stitching easier and produce a more professional looking result. I hope the above information provides you with the tools you need to develop your hooping skills and increase your stitching confidence! More Sewing Room Organizational Tips and Ideas! Thanks to all of you who responded to my post with tips about organizing your sewing space! Many of you had more great tips to share in your comments. Keep them coming! A few questions and requests for further tips were generated by that post, so here is a bit more on organizing your Machine Embroidery supplies and answers to some of the questions. Linda had a good point about placing threads in your “ziploc kit” then potentially needing it for another project and having to dig for that thread. I do keep the “kits” I make up all together in a decorative basket so if I need to borrow an item from one I can get to it easily. If I remove something from a kit, I put a sticky note on the bag indicating what I have removed to make it easier later to put it back in the right place! p.s…For those of us who are “thread-a-holics” it is a bit less of an issue since we often have duplicate colors of thread (aren’t they just so pretty and hard to resist)! Susan had a question about what to do with cocktail napkins. She says she envisions them only for fancy parties. Susan, these little gems find their way into all sorts of fun places! Cocktail napkins are a great party favor for Showers, both Bridal and Baby, when embroidered with cute motifs. They are fun at card parties, family gatherings, game day (embroiderer your team or funny sayings), graduation parties, girls night out, wine and cheese parties, you name it! I have seen these used at kids parties and incorporated into games by embroidering several different motifs to help the kids split into groups for games! They are also functional as well as a fun party favor since they really do work to keep those water rings off the furniture! The blank canvas can be “dressed up” with formal monogramming or “dressed down” with a quirky motif or saying. You can dye them, stamp them, paint them, embroider them, or use rubber stamps! My guests enjoying taking them home after the party as just a fun little keepsake. Barb wondered how to keep the USB sticks on which she saves her machine embroidery designs organized. How about a key ring with the slot for a written label? I have purchased these at hardware stores. The USB can be put on the key ring and the label can serve to write what category of designs are held within. They can then be hung from a key rack in your sewing space. You may find a large key ring on which you could store all your USB sticks! I also use DVD’s to store designs. They hold a large amount of data and have more space to label. Another idea would be to number the USB sticks, then keep a spreadsheet listing the designs along with the USB stick number, then you will have your own catalog of your designs and you could search the spreadsheet for a particular design. It would take time to set up initally, but may save you time down the road! Paula asked how to store stabilizers and Peggy had a great suggestion. She uses a hanging shoe organizer with pockets and hangs it over her sewing room door. She cuts holes in the upper pockets to allow room for the longer rolls to fit. Great idea Peggy! I use a similar item, a gift wrap organizer that hangs on the door. It has roll sized pockets as well as flat pockets for bulk or sheet stabilizers. I also have a long basket in my sewing room in which I store stabilizers. After I take a stabilizer out of it’s original packaging, I either use an elastic band to keep the original label with the roll or I write out the pertinent information about the type of stabilizer on a piece of paper and pin it to the stabilizer. Unlabeled, I can easily confuse types! I hope you found these hints and tips from all of us helpful. Please share your organizational tips in a reply to this post for all to enjoy! New Year, New Projects…Get Organized! Let’s stitch a year filled with Personalized Machine Embroidered Gifts! The beginning of a new year never fails to excite and inspire me! I find myself filled with a satisfied feeling of closure for all that came the year before, and a renewed interest and excitement for the potential of the year ahead. It is a time for me to reflect on what worked in the past year and to organize and plan my Machine Embroidery projects for the coming year. This year, rather than creating a New Year’s Resolution list, I made a New Year’s Embroidery Project List! This January, you will find me in my sewing room sorting, labeling, and reorganizing projects and supplies. I am one of those creative folks who always has at least 10 different projects in process at once, so it is easy for my sewing time and my workspace to get a bit out of hand! The New Year is a wonderful time for me to refocus on those UFO’s (Un Finished Objects!) in my stash and make a plan for the new projects I want to complete in the coming months. I recently purchased a white board for my sewing room and found it to be a great way to keep me organized and on task. I use it to keep my “Sewing To Do” list visible which helps me plan, organize, and prioritize my projects. I start by listing all my current “in-process” projects. Beside each, I list the next step needed for each of these projects and my target date to complete that step. Since I have so many projects going on at once, this keeps me focused and on task with my projects, and prevents me wasting valuable time trying to remember where I left off and what to do next with each. The target date is a gently nudge to keep each project moving ahead a little at a time and it’s so satisfying to see the dates march forward. Zip closing bags are not just for snacks to keep you going while you sew, I find them to be an invaluable sewing tool! I keep each set of project materials together in a clear zip closing plastic bag so I don’t have to hunt for pieces or supplies when I have a few minutes to work on one. I love kits for their economy and convenience, so for each project I make up a “kit”. Before starting a project, I gather all the materials and tools needed to complete the project and store them together in clear zip bag. At the beginning of each machine embroidery project, I gather the blank item for embroidery, all the thread in the colors needed for the design, the printed color stop sheet and template for the design I plan to use, and a piece of the appropriate stabilizer cut to size for the project. Then I find that 20 or 30 minutes to sew on my embroidery machine, and the project is lined up and waiting for me to start! It’s a great time saver and eliminates the inevitable frustration of finding out I don’t have a key component to work on a project when I finally find time to sew! Also on my white board, I list the main events or activities for which I want to create new projects. Upcoming weddings, birthdays, and parties go on this list as well as holidays. I love to use my embroidery machine to create personalized gifts and planning ahead keeps me on track. I hate getting overwhelmed and cramming at the last minute to get them done or worse yet, getting off track completely so I am unable to complete the gift items I intended for each special day. This year I have lined up a set of personalized guest and kitchen towels for the newlyweds, a personalized golf towel for Uncle Joe’s birthday, and a personalized wine bottle cover for the hostess of the upcoming wine and cheese party. Beside each I have listed the desired target completion date. I will continue to add more items as I complete those already on my UFO list! My large family is scattered so when we get together, I try to have something special to commemorate the day. Personalized cocktail napkins or gift bags are a great option. I find our linen and cotton bags are the perfect packaging presentation for almost any gift since they are available in so many different styles and sizes. Adding that special personalized machine embroidered touch allows them to double as a beautiful wrapping for a gift and the recipient is thrilled with the bag as much as the gift! My sister says it’s like getting a “gift within a gift”! I love to personalize these bags with names and initials but also find it fun to add a special or funny motif that reflects the personality of the recipient.